It was baby shower time. My oldest daughter was finally going to be giving birth to my first grandchild. I can’t even begin to tell you how overly excited about that I was. A whole new person to love. How could I not be going crazy? She knows me all too well, so she knew that she needed to give me something to do to keep me busy for the 40 weeks it was going to take for that little boy or girl to arrive. She gave me the responsibility of taking care of the baby shower as soon as she made the announcement. I love to plan and to cook, so that was right up my alley. I didn’t want to take any shortcuts either, so I did my research before planning it all out. We decided to do it BBQ style, seeings as it was going to be in the summer. My daughter loves BBQs so it was perfect. 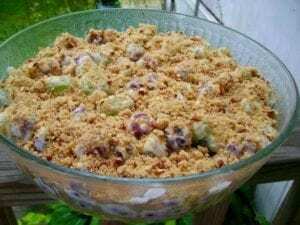 When planning out the menu, I came upon this recipe of grape salad from Julie’s Eats and Treats. I knew that was going to be dessert. It looked so tasty and super fancy, not to mention easy to make… I was all over it. PLEASE, USE THE NEXT PAGE LINK BELOW FOR THE RECIPE AND INGREDIENTS.